Sorry folks - the event is sold out. Those of you who got tickets will be able to pick them up at the check-in desk at the event, which is at Brothers Bar & Grill from 4:30-7:30 PM on January 28th. See you then! You loved LaTroy Hawkins. (There were also times that you also likely hated LaTroy Hawkins.) But after a 21-year MLB career that lasted until he was 42 years old, I expect you respect LaTroy Hawkins. And we KNOW you want to hear from LaTroy Hawkins. Here’s your chance. LaTroy Hawkins will be the headline speaker for the Twins Daily Winter Meltdown, for which you can buy tickets (until they sell out) starting at 8AM tomorrow, January 12th,. Hawkins not only had a remarkable nine year Twins career, but just kept going and going and going, retiring as the only active pitcher who had thrown in over 1000 games. You likely remember “The Hawk” from the end of his Twins career, posting a 2.00 ERA as a shutdown reliever in 2002 and 2003 when the Twins were suddenly winning Central Division crowns. Hawkins has recently returned to the Twins as a special assistant and will share thoughts about his career and the team on Jan 28th at the Winter Meltdown. He’ll be joined by a very special guest, Jack Goin. Goin is the Director of Baseball Research for the Minnesota Twins, and has been with the Twins for fourteen years, including managing their contract administration and tenders prior to moving to baseball research in 2011. He currently oversees the baseball research department, advance scouting process and development of the internal information systems in Baseball Operations. You can also occasionally find Jack in the Twins Daily forums, as he graciously provides no-nonsense answers to questions from Twins Daily’s members. A chance to hear from and meet LaTroy Hawkins and Jack Goin. A Twins Daily Winter Meltdown Pint Glass with Brock Beauchamp's fantastic design (picture below). Two complimentary local craft pints from 612 Brew. I can’t stress this enough: we’ll sell out. Maybe very fast. Please come back to this page tomorrow (Thursday, 1/12, 8 AM) and buy your tickets. We wish we had more. As the Winter Meltdown has gained notoriety over the last few years, the raffle prizes have markedly improved. 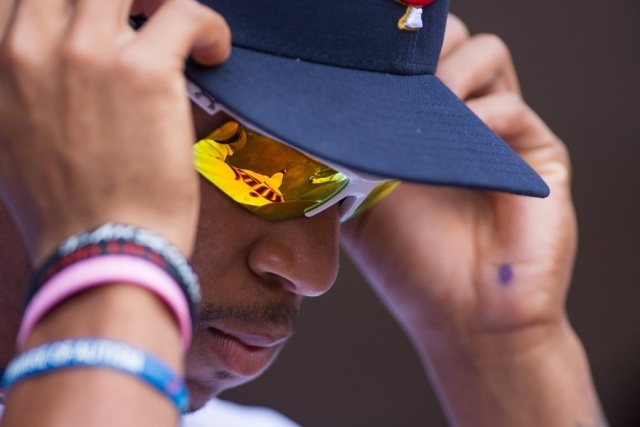 This year, thanks to AME Sports, we have our best grand prize ever: a Byron Buxton signed bat. But the list goes far beyond this top prize. You can also win…. Our host, Brothers Bar and Grill, in addition to gift cards, is providing a one-of-a-kind prize: a front-and-center table during their Opening Day KFAN live broadcasts by Paul Allen and The Common Man. Brothers has hosted KFAN personalities since Target Field opened, and it is always a huge event that fills up quickly. But you’ll have your prime spot as they review their “Duckies and Bunnies” or “Tough Love” previews of the upcoming season. In addition to the Byron Buxton signed bat, AME Sports will be providing a Tom Kelly signed baseball to the winner of our Twitter #TDMeltdown challenge. Just tweet out a picture of the Winter Meltdown with the hashtag #TDMeltdown and you’ll be entered to win. And there is no limit to how many entries you can submit. And that’s not all from AME Sports. They also provide unique player appearance events, such as their upcoming appearance with Minnesota Wild goalie Devan Dubnyk on Jan 18th. Last summer that included an appearance by Eddie Rosario, and you can win a signed photo of Eddie from the event. 612 Brew, in addition to the free beer and pint glasses they’re providing, will also be providing some 612 Brew swag as raffle prizes. 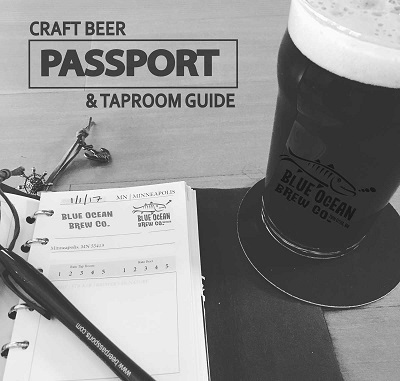 And beer fans can also win a leather-bound Minnesota Craft Beer Passport & Taproom Guide. You can commemorate your tasting experiences with this stylish leather book containing pages dedicated to every taproom in the state. We’ll also have autographed copies of the 2017 Minnesota Twins Prospect Handbook (which you can buy right now), written by Seth Stohs, Jeremy Nygard and Cody Christie. Plus, you can also qualify for free copies of the Baseball Prospectus 2017 Annual, edited by Aaron Gleeman. You can also preorder it right now. But you can only get a shot at all this great stuff if you buy a ticket, and they’ll go fast. Bookmark this page because they’ll be on sale right here at 8 AM this Thursday, January 12th. They will sell out, so please get here as early as you can. It’s cold. It’s snowy. We all need something to melt away this winter. We need a Winter Meltdown. Twins alumni and management will again join us just a couple blocks from Twins Fest on January 28th for the Twins Daily Winter Meltdown. There will free beer, hot stove talk and fantastic raffle prizes, so bookmark this page, because our remaining tickets will be available right here on Thursday morning at 8:00 AM. We will absolutely sell out. 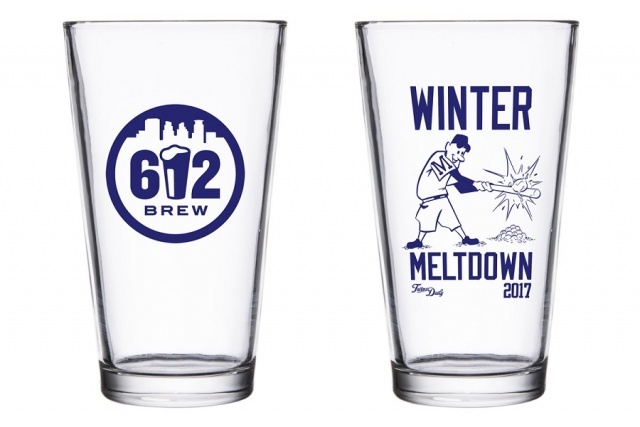 A Twins Daily Winter Meltdown Pint Glass with Brock Beauchamp's fantastic design (picture above). Interviews with special Twins guests (announced Wednesday). It’s only $25 (if you can get tickets). We’ll announce the raffle prizes tomorrow, which includes a grand prize that had our writers literally texting “Wow!” (Seth, no, you cannot win it.) On Wednesday we’ll announce a guest speaker that Aaron Gleeman (who will also be joining us) says is one of his favorite Twins. You’ll be treated to two fantastic locally brewed beers from 612 Brew in Northeast Minneapolis. This is 612 Brew’s fourth year sponsoring our Meltdown and has supported various Twins Daily and Gleeman and the Geek events for several years. You can find their beer in all over the city, including your local liquor store, at US Bank Stadium, and of course in their famous taproom. The tough part will be getting tickets. We’ve sold this out every year. Tickets will go on sale Thursday morning RIGHT HERE at 8:00 AM for just $25. A special pre-Christmas sale took care of most of our inventory, so I HIGHLY RECOMMEND that you find a way to stop by TwinsDaily.com this Thursday morning (1/12) and get your tickets while you still can. Please join us for our biggest event of the year. It’s easy, it’s affordable, it’s crazy fun and you’re going to be kicking yourself that weekend if you can’t be there. Stop by tomorrow and Wednesday for more news on our prizes and guests or follow us on Twitter and Facebook. I may steal the headline raffle prize. 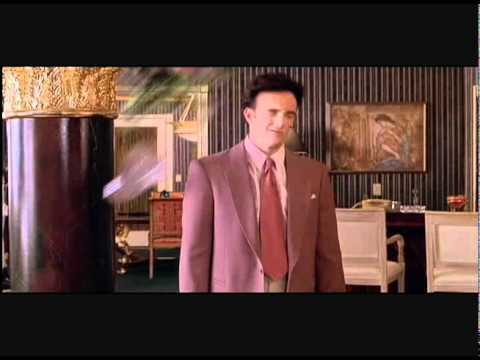 "That's why we don't have nice things." Now I'm thinking I may have to attend. Of course, I was already thinking that because this is a great event. Your contact doesn't know where it is either. No, I mean I have x-ray contact lenses. What did you think I meant? If I win, it's yours. Damn! This sounds fun! Too bad I will be on flight back home from a trip and won't be home until 8:00PM. Bonnes, will anyone be recording this in podcast or video podcast form? At least the speakers? I think you guys tried last year and forgot to hit record or something. . .
Also, I will offer 10 CRISP one dollars bills (plus any loose change I find) to the winner of the Buxton bat, in exchange for me receiving the Buxton bat . LaTroy Hawkins!!? Damn, I wish I could come to this! I started a winning streak at the pub crawl, so I think my wife probably wins the bat. LaTroy Hawkins! Exciting news! I'm so excited for this event! Hawk and Hunter are going to be part of the FSN broadcast team, as well. One of these years I'm going to make this event... Too many weddings to attend, not enough PTO days. Wow! Tickets went fast... Bummer. Oh, man! Sorry about that. It was my fault. I've been fighting off a cold for the past few days and woke up late this morning. Just sayin'. I'd be much more forgiving if you said you were late because you were hung over fighting a cold. We're down to just a handful of tickets remaining so if you want a ticket, order now.